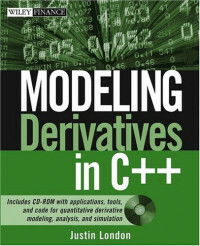 This book is the definitive and most comprehensive guide to modeling derivatives in C++ today. Providing readers with not only the theory and math behind the models, as well as the fundamental concepts of financial engineering, but also actual robust object-oriented C++ code, this is a practical introduction to the most important derivative models used in practice today, including equity (standard and exotics including barrier, lookback, and Asian) and fixed income (bonds, caps, swaptions, swaps, credit) derivatives. The book provides complete C++ implementations for many of the most important derivatives and interest rate pricing models used on Wall Street including Hull-White, BDT, CIR, HJM, and LIBOR Market Model. London illustrates the practical and efficient implementations of these models in real-world situations and discusses the mathematical underpinnings and derivation of the models in a detailed yet accessible manner illustrated by many examples with numerical data as well as real market data. A companion CD contains quantitative libraries, tools, applications, and resources that will be of value to those doing quantitative programming and analysis in C++. Filled with practical advice and helpful tools, Modeling Derivatives in C++ will help readers succeed in understanding and implementing C++ when modeling all types of derivatives. Justin London is the founder and visionary of GlobalMaxTrading.com (GMT), The World’s Online Financial Supermarket®, a global online trading and financial technology company, as well as GlobalMaxAuctions.com, The World’s Online Trading Exchange ®, a global B2C and B2B auction and trading company. He has analyzed and managed bank corporate loan portfolios using credit derivatives in the Asset Portfolio Management Group of a large bank in Chicago, Illinois. He has developed fixed-income and equity models for trading companies and his own quantitative consulting firm. London has written code and algorithms in C++ to price and hedge various equity and fixed-income derivatives with a focus on building interest rate models. A graduate of the University of Michigan, London has five degrees, including a BA in economics and mathematics, an MA in applied economics, and an MS in financial engineering, computer science, and mathematics, respectively.